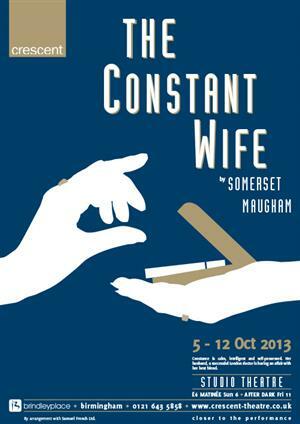 Somerset Maugham’s 1926 comedy is brought to sparkling life in Jaz Davison’s lively production. It tells the story of Constance, the titular wife, whose husband has been having a long-standing affair with one of her best friends. Everyone around Constance strives to hide the ugly truth from her but, it turns out, she has known all along. Constance is nobody’s fool. Red faces all around. But it is what happens next that takes this comedy of manners into Ibsen territory. More assured than Ibsen’s Nora, Maugham’s Constance not only turns the tables on her unfaithful spouse but carves out a niche for herself, claiming that the economic independence she has earned for herself is the key to opening up the rest of her life. She is no more bound to her husband by financial need than she is to convention and, some might say, propriety. It’s a great-looking production, played in-the-round in the theatre’s Ron Barber Studio with a detailed but unfussy set designed by James Rowland, and a parade of 1920s fashions from costume designer Stewart Snape. The women are especially well-dressed with fur stoles draped over their shoulders like roadkill – reminders that the play has become a period piece, and that some aspects of society have changed considerably since it first opened. As Constance, Liz Plumpton cuts an elegant figure. At first she is a little too imperious and not playful enough but she warms up and becomes delightful, her delivery matching the wit of her dialogue. The characters fire off Widean epigrams like champagne corks – some of the cast handle this mannered way of speaking with great ease. Particularly impressive is Jo Hill as Barbara, and Danielle Spittle’s Martha improves as the action unfolds. Plumpton is ably supported by Roger Saunders as old suitor Bernard and Kate Campbell as treacherous Marie-Louise, but it is her moments with husband John that really stand out. Colin Simmonds’s performance is a delight from start to finish as the smarmy philanderer in a beautifully detailed and executed characterisation. And very, very funny. Jaz Davison’s direction has some stylish touches (like the use of butler James Smith for the transitions) but a little lighter handling of the earlier moments would get the performance fizzing along from the get-go. It’s a soufflé on which the oven door has been opened too soon, but the cast rally and aerate the confection as soon as they settle in. From that point on The Constant Wife becomes consistently funny.